Redwings Caldecott Visitor Centre0870 040 0033work Animal SanctuaryFor a FREE and fun family day out, visit Redwings Caledcott and meet friendly rescued horses, ponies, donkeys and mules nose-to-nose. Redwings Caldecott is the rescue charity's largest visitor centre with over 100 residents ready and waiting to meet you- from gentle Shire Fox and his best friend, Bungle to cheeky Shetland Sampson. 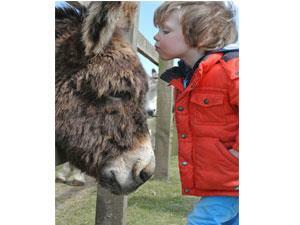 And if you love donkeys, this is the place for you! Redwings Caldecott is home to a whole herd of donkeys - over 30 in fact! - including dainty donkey Esther! The centre also offers a host of fun activities to enjoy including pony grooming, quiz trails and guided tours with Redwings' friendly team who offer a fascinating insight into these beautiful animals, their rescue stories and the charity's work. After exploring the paddock walks, visitors can enjoy hot or cold refreshments in the café and pick up a souvenir from their visit in the gift shop. Coach, community groups and school visits are very welcome, as are dogs so don't forget to bring your pooch along for a day out too. Redwings Caldecott is open every Friday, Saturday, Sunday and Monday, 10am to 4pm (closed on Tuesdays, Wednesdays and Thursdays). Some exciting changes are under way! There are currently some developments at Caldecott Hall where a brand-new gift shop and cafe will located. The visitor facilities have therefore been relocated to a temporary welcome building where catering is not currently available. Click here to read the full details of the exciting development. For a FREE and fun family day out, visit Redwings Caledcott and meet friendly rescued horses, ponies, donkeys and mules nose-to-nose. Cafe, gift shop, information centre, children's play area, picnic area, disabled access, dogs on leads welcome, VAQAS Awarded. Open all year round every Friday, Saturday, Sunday and Monday, 10am to 4pm (closed Tuesdays, Wednesdays and Thursdays). Situated on th A143 between Great Yarmouth and Beccles, opposite Fritton Lake. Disabled parking provided.